SonicSubset – Ramblings on things I find interesting. Ramblings on things I find interesting. While sat on a sun bed on holiday I was looking for some information on the area around our hotel. I simply wanted somewhere to grab a bottle of wine to drink in the room and save a bit of money. This exercise was annoyingly difficult. I ended up abandoning searching and just using Google Maps and hoping local shops had put themselves on it. When I realised they hadn’t I resorted to street view and finally found a corner shop. This made me think why don’t hotels create apps that people can use prior to, during and after their visit. I initially thought these could be apps that simply offer information about the local area, hotel amenities and contact details, etc. But why stop there? Why not have this as somewhere to book your stay, reserve a table for dinner, request more shampoo? You could also go further. An app as a room key, as a way to order drinks to your lounger on the beach, as a way to alert people to things such as happy hour starting, unsuspecting issues like power cuts and more. There is so much you could do. I’m looking forward to heading to a hotel soon and seeing this is action. Why do I write articles and never post them? I have about 10 posts that I have written, half-written and just notes on thoughts that have taken my fancy. I guess this is probably the same for all bloggers but it does make we wonder what is in other people’s draft folder. TLDR: People have used stories to teach and learn and pass on information for the length of human history. Why are we moving this? Everybody likes a good story. That’s why history is full of them. Not because things actually happened that way but because it’s a better story than the truth. Also, and I realise people learn in different ways, stories are better teachers than almost everything else. There is a reason the bible is essentially a collection of stories. It’s not a manual, a to-do list or a set of instructions – it’s a collection of stories that each teach us something. Whether you believe the stories are real or not is the subject of million other blogs and not something I’m going to cover here. This leads me to my frustration with teaching in today’s society – we don’t teach stories anymore. Stories are seen as something for children and leisure. They’re not used as a tool for teaching and the only time they’re found in a classroom is when they’re being picked apart. As previously discussed I listen to a lot of podcasts and the thing I love about them is that they tell a story. Sometimes the point of story is explicit in it’s telling, sometimes it’s down to the listener to take what they will from it, but it’s story telling – and I’m learning loads. Now my friends and family will say it’s not teaching me anything useful but that’s not my point. It’s teaching. We need to get back using a story and all that it contains as a teaching method. For example don’t just teach people about the latest technology but teach them the story. There are loads of choices: the people who invented it, the evolution of the product, how it is built and where the components come from, etc. This not only gives them the end product of what the product is but so much more. It could give them roll models, a bigger view of the world and more. We all have a story to tell and in most people’s case many, many stories. There stories may seem boring, mundane and not worth telling to you but to someone else they could be inspiring and thought provoking. Stories engage us, they teach us and best of all we it’s something we all enjoy. Even if it’s a game, a movie or a book they are all stories. Let’s tell more stories (though my friends will often say I need to tell less stories but that’s another post). If you need a push to reading more I’d recommend this article or start with some podcasts. TLDR: I used to download music, then I tried streaming services and now I use curated mixtapes (and podcasts). I’ve been thinking recently how the way I consume music has changed over the years. I hate music radio and always have so that’s never been an option and unfortunately Birmingham isn’t known for it’s thriving music scene (it’s not bad, it’s just not very good either). Once upon a time I bought singles (my first was Don’t Speak by No Doubt) and albums (my first was Bad by Michael Jackson). I had a pretty decent collection too. I then moved on to MP3s and downloaded as many as I could possibly get my hands on. I tried my best to keep my library (folders at that time) tidy and even used a bulk ID3 tag editor to get the song info correct. I got my MP3s from loads of different places such as Soundcloud, bands sites and this is when I signed up to my first music subscription service emusic. Here you sign up and can download a certain amount of tracks per month for a fee. The music is DRM free and I still have some of those tracks in my current library. As times moved on I started sharing MP3s and got a load more from friends. This is when I realised I really didn’t like having to trawl through thousands of tracks to find something I wanted to listen to so I deleted GBs of music and enjoyed keeping my music collection organised. Then came Spotify and Rdio. I swapped between these services over a span of about 3 years trying them intermittently as they traded features (web player, decent radio, etc). I then gave up on music for a bit as finding music became more hassle than I found was worth it. In the past I’d really enjoyed that process, watched late night MTV, trawling YouTube with friends, fumbling for SoundHound or Shazam when a song I like came on in a club or pub. However it felt like, with the ability remix and make music easier, that there was too much bad music to sift through, so I stopped. About this time I also discovered podcasts (you can read more on what I listen to in my previous post) and so stopped listening to music altogether. Then I discovered mixtapes! Hour long, or even longer in most cases, tracks of music curated by artists, producers and people who’s opinions and tastes I trusted. It all started with The Fox Is Black (previously Kitsune Noir) a site by Bobby Solomon. He used to a create (curate is probably more accurate) a regular mixtape that was amazing. Each mixtape now transports me to a specific time in my life but that’s another post I’m writing. I even used one as music for during the meal at my wedding. From there I found Friday Mixtape which is again simply a curated mixtape by Duncan Rawlinson. This is by far my favourite collection and I have downloaded all of them (though deleted the ones I don’t like) over the year or so since finding them. Between these 2 that was about all the music I listened to for a long time. I have recently added Noon Pacific and MixRadio to my go to places for music and enjoy just hitting play and enjoying what get’s played. I’ve always been told to think before you speak and I’d like to think I’m pretty good at it. However it seems that the world is against me in this matter. There are a bunch of phrases out there that don’t make sense. When I first heard this I wanted to ask a couple of questions. Are there lots of people out there who have cake but don’t eat it? And does the fact that when I have cake I eat it make me a bad person? 2. There is an exception to every rule. This doesn’t make sense. If there was an exception to every rule then there would be an exception to this rule, meaning that there is a rule without an exception meaning that this rule isn’t true. I know I’m over thinking this, I know it doesn’t matter as much as I’m making out but they still annoy me. However while writing this I google ‘phrase’ and ended up on the Wikipedia page. It’s amazing reading the technical aspects behind a phrase and definitely worth a read. Initially I thought I was late to the podcast party and it’s day had come and past. However since then I have realised that as people get used to watching tv on demand through the likes of Netflix, iPlayer, 4OD, etc then there’s no reason why they wouldn’t want radio-on-demand. I just think the issue is people don’t see podcasts as radio-on-demand. They see it as it’s own thing, with it’s own shows and as time goes on that isn’t the case. Only time will tell on podcasts but personally I love them and think they’re a great way to spend a long commute home. It’s worth noting that I use Pocket Casts. 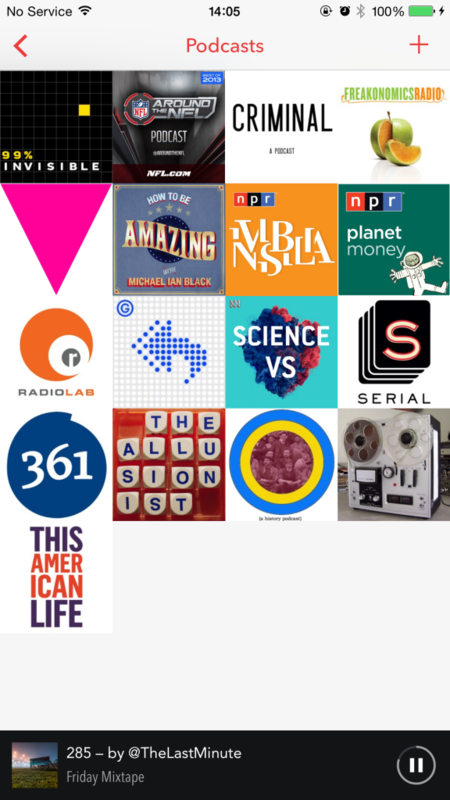 It’s a wicked podcast app and the best I’ve found. I am going to try and write something here on a weekly basis so if you’re reading this feel free to drop back next week for another instalment. Yes I cheating a bit by writing this weeks post about writing posts weekly but I am hoping that by writing, and more importantly publishing this, I will keep this up. As this is a particularly boring post here’s something that’s not. The Friday Mixtape is a weekly compilation that you can listen to and download for free. The music flows from cool beats to heavy dance through hip-hop and is a great accompaniment to a Friday drive home or getting ready for a night out. The website is curated by Duncan Rawlinson aka @TheLastMinute aka @FridayMixtape aka @PhotographyIcon. It’s probably bad form to simply post straight from your website to someone else’s but these guys do a much better job of explaining it than me. Ok so now you know what it is there is the why. Again another link but a much more informed voice than mine (Joshua Fields Millburn, of The Minimalists fame). The next step is trying to work out how this fits to my life, my family and my values. I’m going to discuss this in more detail and length moving forward. Sounds like a Fisher Price toy doesn’t it… a really boring, really lame toy. I dread to think how many times in the past I have tried to write a blog. Ultimately I get caught up in how it looks, how it reads, what does it say about me, etc and then I don’t bother writing for it. Until now that is. In the past I have been too wrapped up in consuming content, whether that be books, articles, videos, etc, but recently I have been reading more and more that says you get more out of creating rather than consuming so here goes. I am hoping to cover off topics I like, stories I have found interesting and generally just creating a place where I can create something, that hopefully someone, someday will read.